At Denver Artificial Grass Pros, we understand how important it is to have a playing surface that looks attractive, performs beautifully, and is also easy to maintain. Our Signature Series artificial golf greens provide unparalleled realism in terms of surface quality and aesthetics. 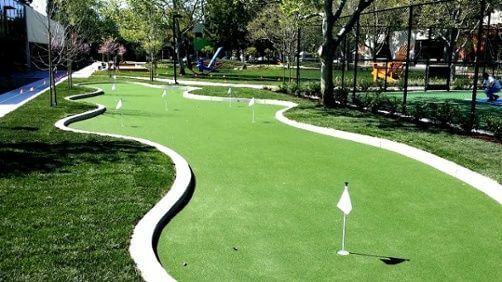 It is the ideal choice for artificial putting greens, miniature golf, driving ranges, and other athletic turf necessities. Our artificial putting green turf delivers a true golfing experience, because we install only the highest quality professional grade products. Denver Artificial Grass Pros synthetic grass offers the longest life expectancy, and our superior drainage system ensures surfaces dry quickly with no pooled water. Of course you never have to water our artificial turf, but when it rains, play can resume faster. WHY GET ARTIFICIAL GRASS FOR COMMERCIAL GOLF? Does your driving range need a little tune-up or repair? Eliminate those recurring expenses by switching to Denver Artificial Grass Pros’ golf greens turf. Our driving range material is highly effective in lowering long-term maintenance costs. This unique material ensures excellent drainage and erosion control, so it’s also ideal for solving large ground cover problems and controlling weeds. Denver Artificial Grass Pros can design and build custom spec jobs, including details such as matching logo colors, custom-designed tee lines, elevated bunkers, and separate driving ranges. Our friendly, knowledgeable design, and installation team can work with you to create whatever configuration of breaks, elevations, hole placement, and bunkers you want. Tired of growing and mowing your lawn? Maybe it’s high time you try artificial turf. Not only does this need less maintenance, but it’s also quite appealing and offers unparalleled underfoot comfort. We install high-quality artificial grass to properties in many areas in Colorado, particularly Denver and Aurora. If you are interested in installing artificial grass on your backyard or front garden today, then contact us by filling out the online form. PLEASE NOTE: THIS IS ONLY A MAILING ADDRESS. WE DO NOT HAVE AN OFFICE. Don’t hesitate to contact us at Denver Artificial Grass Pros to find out more. Our team can walk you through your artificial turf options, as well as the processes we employ in installing them. We might even be able to offer some creative ideas, if you ever need them. © 2019 Denver Artificial Grass Pros - All Rights Reserved.